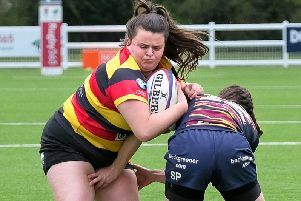 Harrogate Pythons suffered an afternoon of frustration as they drew a blank against struggling Baildon at Station View. The West Yorkshire outfit arrived in Starbeck bottom of the Yorkshire Three table, but produced a resolute defensive performance that earned them a 6-0 victory on a heavy, damp pitch. Some powerful running from Nathan Wake and George Wilton bought the best out of Baildon’s defence, who tackled hard and kept their shape under a prolonged barrage. Home centres Jon Pickard and Stuart Illingworth looked to open up the away defence in midfield, but once again they could not find a breakthrough. Conditions dictated that penalty opportunities were taken as set scrums where the Pythons dominated, releasing fly-half Ross Fallenstein to look for rare gaps in the Baildon line. Despite some good support play by Luke Price-Gerrard and Hugh Tatlow as the hosts continued to pour forwards, superb organisation and committed tackling by the visitors ensured that there was no way over the whitewash. On the first occasion that Baildon broke into the Pythons’ half through a well-worked backs move, the home team had to do some defending of their own. They initially responded well, but after three phases they were penalised for not releasing in the tackle and the visitors kicked a penalty goal for a 3-0 half-time lead. The second period saw the West Yorkshiremen’s confidence grow as they piled on pressure through a series of driving mauls. The Pythons eventually responded, with full-back Max Sharp running some great lines and winger Matt Halpin showing his pace, however the touchline saved the away side on two occasions as the hosts ran out of space and were forced out of play. Indiscipline on the home 22 then saw Dan Bird’s side penalised once again for not releasing in the tackle and a second successful shot at goal put Baildon 6-0 up, which is how the game ended. The Pythons remain ninth in the league standings despite the defeat. They welcome Stocksbridge, another relegation-threatened side, to Station View on Saturday.